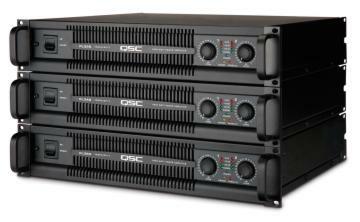 Comprising three models ranging in size from 2,500 to 8,000 watts, QSC's new PowerLight 3 Series amplifiers bring a new degree of flexibility to touring and installed sound reinforcement applications. Offering a choice of DSP with remote control and monitoring via BASIS, or the value-oriented performance of straightforward analogue input operation, the lightweight, 2RU lineup facilitates a wide-ranging level of networked functionality or none at all. Putting forth power, audio quality, and QSC reliability, each PowerLight 3 model delivers higher input voltage and selectable sensitivity, and is easily adjusted via a series of rear panel switches with color-coded LED indicators. Thanks in no small part to its excellent value and zero signal latency, the line is an ideal choice for those simply seeking a high performance amplifier for use with an existing processor or console. Conversely, when complete integration of amplifier control, monitoring, and DSP is required, the PowerLight 3 Series is ready with fully-compatible facilities for the QSControl.net/BASIS network audio platform's drag-and-drop DSP functionality, or lesser DSP requirements that can be met with QSC's DSP4 processing module. Residing at the top of the PowerLight 3 line is the 8,000-watt model PL380 which combines a pair of 4,000-watt Class-D amplifier channels with QSC's PowerLight power supply to serve up more than twice the audio power of any previous 2RU PowerLight amplifier. Within the PL380 circuitry, reactive 'back EMF' from the loudspeakers is recycled into the power supply to help promote a plug-to-plug efficiency rating of 85% that reduces AC power consumption to a bare minimum, all while delivering more energy to the loudspeakers. Operable between 20 Hz and 20 kHz, the PL380's defining characteristic is its headroom. Capable of taking on difficult loads without showing signs of stress or changes in tonality, the amplifier's performance is further enhanced by features such as silent, surge-free switching. Carried on a four-layer printed circuit board with three-ounce copper, the PL380’s formidable electrical power travels through a revised grounding and shielding scheme that keeps switching noise out of the audio circuitry. Models PL325 and PL340 complete the PowerLight 3 Series. Suitable for use in lower-power applications, both amplifiers share the same feature set as the PL380, albeit matched to upgraded versions of QSC's most advanced linear, Class H amplifier platform. Increased power supply capacitance in both amps is responsible for boosting two-ohm power ratings to approximately 2,000 watts per channel in model PL340, and 1,250 watts per channel in the PL325. Along with these gains in low impedance performance, both amps provide system designers with a choice of running a single type of amplifier throughout their system, or matching each amplifier to the needs of specific transducers. When compared to competitive offerings, back-to-front airflow in every PowerLight 3 model has the capacity to double long-term average power without dumping hot air into the rack. Every PowerLight 3 model is built in the same chassis size, with common back panel layouts that facilitate racking and connectivity. Other features shared across the line include detented gain controls with 1 dB increments, removable knobs with a lockout security plate, three selectable input gains of 1.2V, 32 dB, or 26 dB, and QSC's proprietary parallel Dataport, which works in tandem with XLR/M and XLR/F connectors to promote simple loop-through operation.